Submitted by witness on Saturday, August 17, 2013. 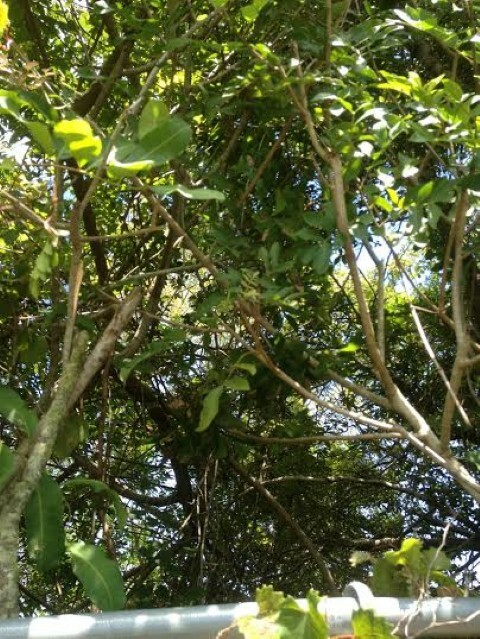 LOCATION DETAILS: It is a wooded area, with a small lake. Please DO NOT post my location!. OBSERVED: Early Saturday morning about 1:55am I went outside for a smoke before bed and it happened. I heard a clinking sound of the chain-link fence clinking on the bar-rail fence. At the very same time I heard the sound of the brush/bushes being smashed. I looked over in the direction of the sound and seen a leg hanging down. As I looked up I seen a large hairy back. The thing turned and looked right at me. Just after it made eye contact with me it pulled its leg right back up and over the fence. It actually used the bar of the top of the fence to leap back onto the brush/thicket area. It was huge, from what I could see. This is not my first encounter with what I believe was one. I was on a walk at around the same time of early morning a few months ago and actually felt something run by me on that same side of fence-row. As the thing ran by me I could feel the vibrations of it moving by me. It sounded like it was tearing through the thick brush with no problem at all. I didn't report this before because I didn't actually see it, only felt & heard it. However this time I know what I saw! No doubt in my mind. Even woke up my 25yr old daughter to come and try to see it. She heard it, and smelled it. 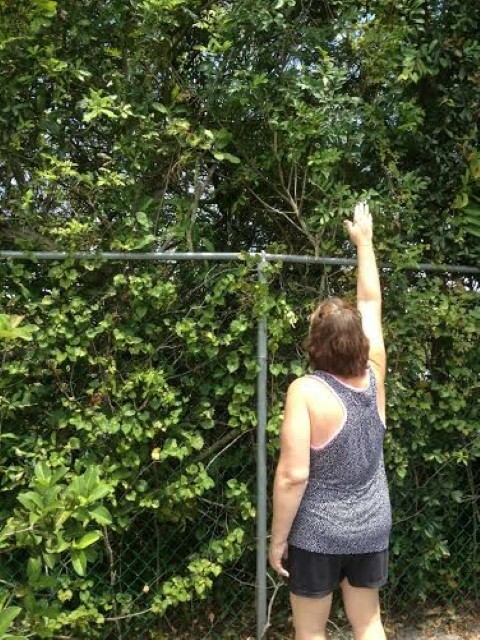 ALSO NOTICED: We walked over to where I seen it climbing over the fence and could see broken small branches and the top bar of the fence was slightly bent. OTHER WITNESSES: My daughter only heard it moving around when I ran in to tell her what had happened. It was still moving about the area when she came out. OTHER STORIES: Only my own experience from a few months before. I never told anyone but my friends and family in Indiana. I didn't want my neighbors thinking I am crazy. TIME AND CONDITIONS: It was 1:55am. It was right under a security light and raining very lightly. I spoke to the witness by phone and later investigated the surrounding area several times. BFRO Investigator Marion Gant accompanied me. We found the witness and her family very credible and honest. The witness stepped outside her home and into her carport to smoke a cigarette. It had been drizzling rain on and off. Once outside, she noticed a foul pungent smell at about the same time she heard rattling from the chain link fence about 40 yards from her. She looked and saw what appeared at first to be a large man straddling the fence. The right leg was on her side and the left leg was on the other; its back was to her and it was facing the other direction. She described the right leg as very muscular and massive. Both of its hands were holding the top of the fence on either side of its body. 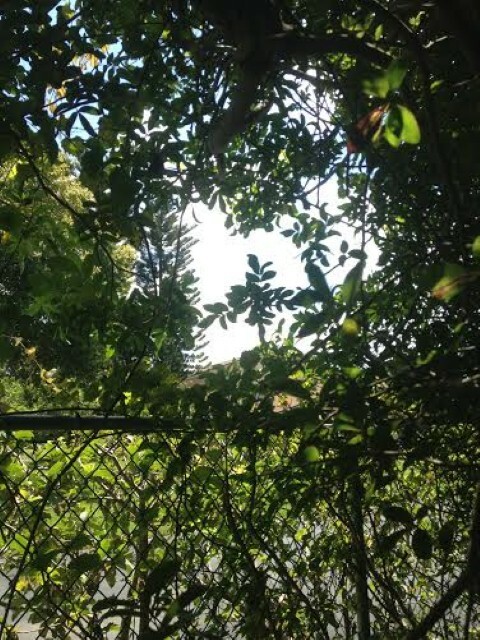 There is a street lamp close to the fence and she could see that it wasn’t a man and that it appeared to be an ape. Immediately, it turned not just its head, but its torso to her and made eye contact. She noticed a yellow/amber shine to the eyes. Its chin was sitting on its shoulder when it had turned its body. Once it made eye contact, it swung the right leg back over the fence and dropped off the top of the fence. She heard it move away. It didn’t seem to run, but she heard branches breaking. It had 3-4 inch light brown to dark blond hair all over its body and estimates its height at about 6 feet. She said the hair was not tangled, but kept “like a dog.” It did not have hair on its face but had “man like” features. She did not notice ears and the head shape was “like ours” only bigger. She claimed its face looked startled to see her. The witness also described something that ran on the other side of the fence, shaking the ground a few months earlier. It is evident something very heavy did this to the top of the fence. There was also freshly broken branches in the wood line where it would have come through. 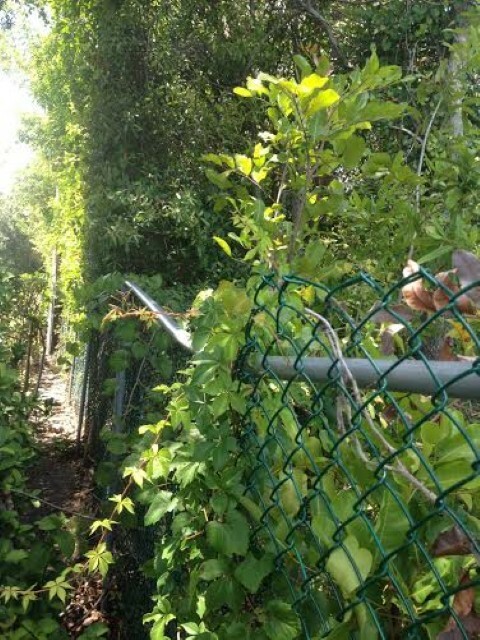 A power line road borders one side of her property; there is a heavily wooded lot that connects to a private high school (on summer break at the time), a golf course and then the coast line of Tampa Bay. If the coast line or power line is followed north, it runs into nature preserves and parks. We found evidence of many food sources in the area from small animals to dumpsters, including numerous raccoon tracks. When looking at satellite photos, there are not many green areas and for the most part the green areas that are present are small. One would really not expect to ever have a report here, its not a typical habitat for sasquatch. However, just north of where the peninsula begins, there is the Tarpon Canal/Lake Tarpon Area and Brooker Creek Preserve which has had sightings. Urban sprawl has pushed many animals into areas they normally would not venture, and I imagine the sasquatch are affected by this too.